Who needs gas when you’ve got the sun? 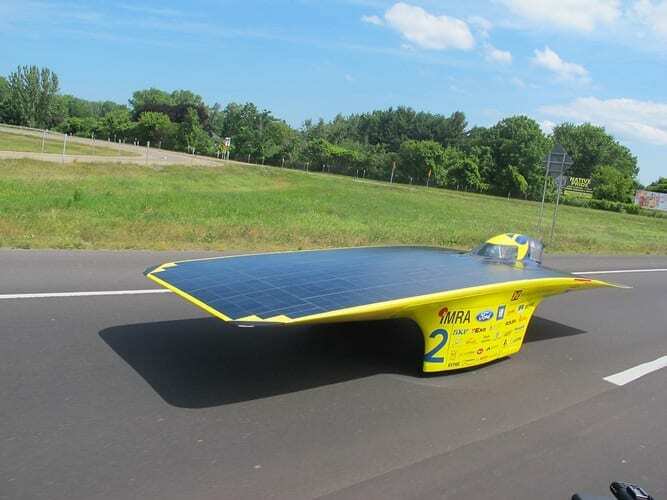 This car won the North American Solar Challenge by more than 10 hours. Find out how the team did it. Michigan, home of gasoline-powered automobiles and a growing piece of the electric vehicle industry, is also harboring an inspiring yet relatively little-known vehicle project: the University of Michigan Solar Car Team–the most successful solar car team in the country. The team recently took home its seventh win in the North American Solar Challenge (NASC), taking its solar-powered, single-seater Quantum race vehicle 1,650 miles in eight days–from Rochester, New York, all the way to St. Paul, Minnesota. The team won with the largest margin of victory in the history of the race, besting the second place team (Iowa State University) by 10 hours and 18 minutes. What makes the Quantum so special? The solar vehicle, which is the 11th built by the Michigan team, has a number of advantages: It’s relatively light, weighing 320 pounds sans driver (200 pounds lighter than the Michigan team’s last vehicle); it’s 30% more aerodynamic than the team’s previous vehicle, and it has been extensively tested in the rain. That last advantage came in handy during this year’s race, which saw rain on two of the competition days. The vehicle can also go 105 mph.